Behind the scenes with HBO Barry's Anthony Carrigan – AiPT! Anthony Carrigan picks the ideal superhero role, discusses his role on Barry, and more. There are some shows that are so unique and special you have to watch them. Breaking Bad and Mad Men come to mind and more recently HBO’s Barry. This dark comedy features a hit man attempting to retire from killing, but he just can’t seem to free himself from that world. The first season of the show won two Emmy’s for acting as well as a writers guild award and based on how good season two has been I suspect the awards will keep coming. This is largely due to the clever premise, but also its cast which includes actor Anthony Carrigan who plays Noho Hank. 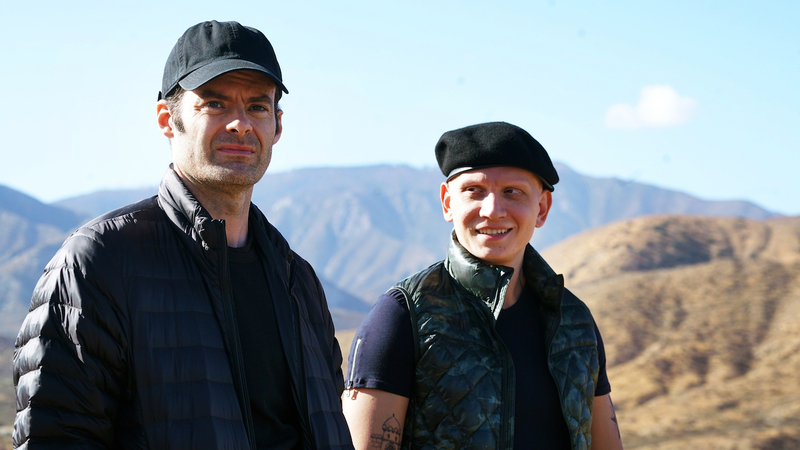 Season 2 has been even sharper than the first and that’s in large part to Anthony Carrigan who plays part friend and part antagonist to series lead Barry played by Bill Hader. I was lucky enough to chat with Carrigan about the latest season of Barry, his work as Victor Zsasz on Gotham, which superhero he’d love to play in a Marvel Studios movie, and so much more! AiPT! : I always tell people the funniest character isn’t Bill Hader but Anthony Carrigan. I just want to see you in every type of comedy I can think of because when I watch Barry I wonder, is it all scripted because it feels like a lot of it is in the moment; like you are riffing. AC: Yeah. We do a lot of improv. I mean the scenes in the episode they’re already so good. So it’s like it almost feels like a crime to deviate from it. But when you’re in there and when you’re working with people who are so incredibly talented like Bill, for instance, he has such a strong background with riffing and improvising; it’s hard not to. So he’ll throw you a curveball and every once in a while you really have to think on your feet. It generally leads to the best stuff though, you know because it’s just spontaneous and spur of the moment. AiPT! : It’s probably more fun that way too in a sense. AC: Yeah. It’s really fun. I mean, you know, it’s terrifying because you don’t know what you’re going to say. And a little bit is just kind of trusting the characters that you’ve built up. You kind of just channel it essentially. AiPT! : Is it hard not to break when you’re in this role? AC: Yes! It’s so easy to break because everyone is so incredibly funny. And some of the circumstances are just so ridiculous that it’s really, really hard to keep a straight face. AiPT! : I love the direction they’re taking your character too. Noho is clearly a character that wants to be like loved and wants friends. Now that he’s sort of a mob boss what do you think Nohos American dream is? What does he want besides friends? AC: I mean yeah. Friends definitely. He wants a good community he can rely on you know. And in terms of emotional needs and emotional support. Obviously. But also, I don’t know, I feel like he’s certainly someone who is a people pleaser. He wants to take care of people. So I think he would do something in the hotel business. Most likely. AiPT! : Have you come up with a backstory for Noho or did they give you a backstory when you took on the role? AC: Well you know here’s the funny thing, you don’t really get too much, and I’ve spoken with Bill Hader and Alec Berg about his backstory. Until it comes to fruition you kind of have to piece it together in a very big way. So I have an idea of what his backstory is. To a certain extent at least and specific things that help me kind of embody him. But the very specific details those are limited. AiPT! : That probably makes it easier to approach every scene differently. AiPT! : In the first two episodes we’ve seen your character kind of get bullied in a sense and we’ve seen him go from zero to 100 in emotions. Is it difficult to go from the happy quipping character to possibly one of the darkest characters in the show? AC: Personally I really feel for Hank because he really does mean well. He is such an optimistic and joyful person, but you know everyone has a line that once it’s crossed you know they have to stand up for themselves. Barry, kind of calling him an idiot, really hurts his feelings. And you know whenever someone gets their feelings hurt that pain comes out as anger and darkness. AiPT! : Here’s a silly question. How do you think Hank would do in Cousineau’s acting class. AC: I’ve really thought about this actually. This is something that I’ve really mulled over. I think he would certainly be one of the most eager students. That’s for sure. I like to think that he’d be very well versed in physical comedy. Who knows he might end up surprising everyone with a brilliant Chekhov monologue. Completely in Russian. That’s just wow’s everyone, And he’s just totally unaware of what he just did. AiPT! : Is there really a favorite moment or scene you’ve shot in the season so far? Obviously, you can’t spoil anything. AC: Yeah. Honestly, the first scene where Hank kind of stands up to Barry. That was a really fun one for me because it was a different side of Hank and an aside that I was very excited to start fleshing out; but also because it was the closest Hank has been to the acting class. I think what makes the show work is that there’s all of these different kinds of worlds and the closer the world gets together the more dangerous it becomes. AiPT! : The more chaotic it gets the closer the worlds get. AC: Right. That and then also the scene where we’re just in the car at the beginning of episode two just because we just couldn’t stop laughing. AiPT! : Clearly, you have a knack for vibrant characters with Noho Hank but also Victor Zsasz and the Mist in Flash. You’ve already played two characters in the superhero realm so I want to ask since our web site is very much superhero related. If you could be a Marvel or DC movie superhero, or villain, which would you want to play? AC: It’s a great question. Well, honestly, I think I would certainly have fun playing Silver Surfer. And I don’t think it’s that big of a stretch either because you know I already don’t have any hair, eyebrows or eyelashes. I literally just need some silver body paint. And then a thong. AiPT! : That is an interesting character because you can be kind of weird and introspective and interesting. AC: Oh yeah. I feel like I would have a field day coming up with something different that would honor the comic but that would also just kind of carve out something unique. AiPT! : Do you read comic books? AC: Here and there. I have a healthy enough respect for people who do actually read comic books that I can say I’m not a mega fan. Certainly, I love graphic novels. And preparing for my roles I certainly looked at a lot of stuff for Victor Zsasz. And even found some stuff online for The Mist. AiPT! : Zsasz is such a key character in Batman and I can’t believe I haven’t seen him in a more prominent role in the movies so far. AC: Yeah, well he will be actually in the Birds of Prey movie. That’s really exciting. Chris Messina is going to be playing Zsasz. I’m really excited to see what he does with it. I love it when a new actor takes on a character just because it’s really fun to see what they’re going to do with it you know and I think it’s tempting to be like, “There’s only going to be one Hellboy, there’s going to be one, whatever, Joker!” But can you imagine if they had just retired the Joker after Jack Nicholson? Then you wouldn’t have gotten Heath Ledger’s performance. AiPT! : Exactly. Yeah, Joker is a really good choice there because people are still upset from both sides about who is the best Joker and whatnot. AC: Right. What’s cool is that there’s always room for interpretation and these stories can be told over and over and over again. I mean look at Shakespeare. People are going still going to see Shakespeare plays and these plays have been done for hundreds of years. AiPT! : And film directors keep making adaptations too. AiPT! : Are you familiar with the hero’s journey?. AC: Yeah, Joseph Campbell. Absolutely. AiPT! : So I’m curious, could you place Noho on the hero’s journey? If so where would he be on that circular sort of journey? AC: Oh I don’t know actually because I mean, I feel like that can’t be done within the context of the whole story. But yeah I think I suppose that’s a good question. AiPT! Is the show only about 20 percent through the arc of his complete story? AC: I don’t know. That’s one of the things that you kind of don’t really know until it’s over. AiPT! : I was thinking with Episode 3, Barry is sort of mentoring him in a sense helping him with that army. Maybe he’s reached the mentor part like with Obi-Wan and Luke. AC: Exactly, the kind of teacher and the disciple. I think that certainly could be and that certainly could kind of play. But yeah I don’t know. I mean hopefully, there’s going to be a lot more to come. And this is certainly a season about people’s true natures and how much they fight to keep that at bay. AiPT! : That’s well said. Now when are you hosting SNL? AiPT! : Would you take it? AiPT! : [laughs] All right. Putting on my calendar I can’t wait for that episode. AiPT! : Well thanks a lot for your time. I think this was a lot of fun. AC: Yeah so much fun! Thanks so much. It was a great interview.